Sat twiddling your thumbs, thinking “what shall I do this week?” Driven by an urge to dance alongside strangers in an open-air setting to uplifting world music, or in an industrial super-club to fresh, genre-pushing musicians? Perhaps you’re desperate to see that blockbuster theatre show which sold out months ago? Need a good laugh? Need a good cry? Thank goodness you found yourself here – we can scratch all those itches for you, and lo, your thumbs shall twiddle no more. We’ve been pretty excited by Afropunk Festival for a few months now – and Gina Yashere also spoke highly of the New York import in this interview a few weeks back. London’s newest and, in our humble opinion, finest super-club Printworks is hosting this two-day festival. Afropunk brings together a diverse line-up of artists, all currently pushing the boundaries of their respective genres – highlights include fuzzy Detroit MC Danny Brown, jazzy songwriter Lianne La Havas and Jeremy Corbyn’s new best friend, grime artist JME. Afropunk Festival takes place at Printworks, SE16 7PJ, from July 22-23. Day tickets are £45 in advance, or £50 on the day, and weekend tickets are £75 advance or £90 on the day. Christopher Nolan’s latest blockbuster is out in cinema’s on July 21, and it’s quite possibly the summer’s biggest movie. It tells the story of the evacuation of over 300,000 Allied troops from the beaches of Dunkirk, as German troops slowly advanced on their position. The stellar cast includes Tom Hardy, Mark Rylance, Cillian Murphy and, intriguingly, the big-screen debut of Harry Styles. Hans Zimmer once again provides Nolan with the score and the combination of these elements makes this a film definitely worth catching in the cinema. Dunkirk is out in cinemas across London on July 21. Tickets will vary according to your local ‘plex. Dunkirk. Image courtesy of Warner Bros. The National Theatre’s production of Angels in America is one of the biggest theatre shows in years – with a cast that includes A-lister Andrew Garfield, rising British star Russell Tovey, the incomparable Denise Gough, Broadway sensation Nathan Lane and another fine actor in James McArdle. Tony Kushner’s epic, multi award-winning two part play tackles the AIDS crisis in mid-1980s America but also deals with pretty cosmic philosophy. If you didn’t manage to get tickets, and don’t fancy queuing from 6am for day seats, then NT Live are broadcasting Part One on July 21 and Part Two a week later. NT Live: Angels in America will be broadcast in selected cinemas on July 21 (Part One) and July 27 (Part Two), with ‘encore’ screening to follow in August. Tickets vary slightly according to cinema, but are around £20. Of course, if you fancy a trip to the theatre but you’re not sure you can handle a serious five-hour epic, then perhaps a trip to Battersea Arts Centre is the thing for you. Also multi award-winners, comedy trio Sleeping Trees perform a trilogy of movie homages in a special preview before they take the trip up to Edinburgh Fringe. Western?, Mafia? and Sci-Fi? are all hour-long mash-ups of every film in the genre that the group could possibly knit together, and they are guaranteed to leave you with a big grin. Let’s face it – we all need a good laugh these days! Sleeping Trees: Double Bill is at Battersea Arts Centre from July 20-21. Tickets are £10. Camberwell Fair has a far longer history than you might expect – it first started in 1279, and proceeded to run annually for almost 600 years until local authorities put a stop to it in 1855 on the grounds that it had become a hot-bed for working class over-indulgence in hedonistic activities. Thankfully, 2015 saw Southwark Council and ACE help usher in its return, and now we can all engage in a little light hedonism with the help of two immaculately programmed music stages, a crowd of good people and the terribly exciting return of London party legends Passing Clouds, who host a cocktail bar. 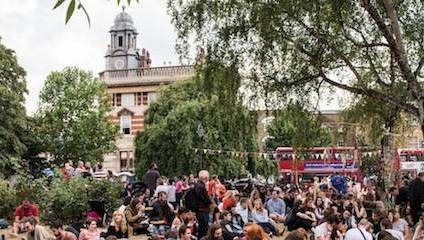 Camberwell Fair takes place at Camberwell Green on July 22. Suggested entry donation is £2.